In December I found a cool blog challenge about baking for children that chose as its theme that month baking a recipe from a children’s book. I picked Turkish Delight from The Lion, the Witch and the Wardrobe, and it prompted me to decide I would make this an occasional series on my blog – Food from Fiction. I then had a look on the internet and found that there are already a couple of blog challenges along these lines; I found one called Cook The Books that picks a particular book each month and asks you to bake something from, or inspired by, that book. However I hadn’t read most of the books they’d chosen, and while I think that would be a good way to discover new literature, I’ve already got a massive pile of books at home I haven’t read, so I was reticent about adding another one to the list. 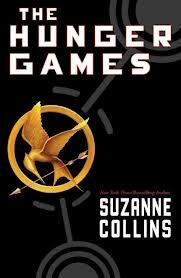 So I was really excited to see what book they had picked for January – The Hunger Games by Suzanne Collins. I am a big fan of the Hunger Games and loved the film so much that I immediately bought the following two books in the series and read them right away. I hadn’t actually read the first book however, having just watched the film, so I was pleased when I came across a blog challenge that encouraged me to get the first book on my Kindle as well – and I read it entirely in one evening! Spoilers follow if you haven’t read the book/seen the film…. Food plays an important role in the Hunger Games – without trying to sound too much like I'm writing a GCSE English essay, it is a method of control and it underlines the divide between rich and poor, not just between the Capitol and the Districts but even within District 12, the poor mine workers who live in the seam and must forage and hunt illegally in order to eat, and the townsfolk who buy bread from the bakery. Another way in which food is used for control is in the tesserae – those who need extra grain can have their names entered more times in the reaping. They are effectively putting their lives on the line for food. I’d almost overlooked the title of the novel itself – the Hunger Games are not only about survival against the other tributes and the traps the Gamesmakers set, but also a struggle against hunger. Katniss mentions that in previous Games, tributes have died of hunger and thirst; when she destroys the food store of the Careers, she remarks “Now the Hunger Games will really begin” – she is used to foraging and killing her own food but the Careers, who come from the wealthiest District outside the Capitol, are not. There is also a key scene when Katniss is on the brink of starvation and scavenging for food, the baker’s son Peeta throws her two burnt loaves of bread. We later discover he burnt them deliberately, for which he was beaten, so he could help her family; Katniss feels forever in Peeta’s debt and this moment between the two of them resurfaces more than once in the books. It was only when I started reading the book however that I realised just how many occasions there are when food comes to the forefront – even on the very first page, when Katniss’s sister Prim gives her a good luck gift before the reaping – a goat’s cheese wrapped in basil leaves. Most of the foods mentioned in the Hunger Games are not particularly things I would want to cook – the berries Katniss gathers in the woods, the fish she catches, and then trades for soup at the Hob; though I did think perhaps I should make bread as it’s such a key food in the book. As well as the gift from Peeta mentioned above, there is also an memorable scene when District 11 delivers to Katniss a loaf of its traditional bread as a thankyou for what she did for Rue. I started off by tackling the bread rolls. I did it the easy way and used my breadmaker, so I just added all the ingredients to the machine and selected the correct setting. 2 hours and 20 mins later I had a nice lump of dough. I wasn't sure how to make the rolls look like flowers so I had a look on the internet for inspiration, and decided that knots would look most like flowers. You take a piece of dough and roll it on the worktop under your palm to make a long rope. Tie it in a knot and tuck the ends over and you have a knot. After the rolls came out of the oven, I decided they looked a little like flowers... not perfect but this was the best I could do! Then I added some segments from the orange (that I had taken out before I juiced it). I also used a little cornflour to thicken the sauce slightly. In the book, the chicken is served on a bed of "pearly white grain" - so I cooked some rice. I skipped the green peas as neither me nor my boyfriend like them, and I couldn't get hold of any baby onions (other than pickled, and I didn't want to use those). I served the bread roll on the side with the main course. Finally for dessert, a "pudding the colour of honey". I found a recipe for honey pannacotta that I thought would be perfect. The original recipe is from a book called Sweet Designs by Amy Atlas, but I have adapted it. Mix the milk and the powdered gelatine and leave for five minutes to thicken. Combine the cream, vanilla seeds, honey and sugar in a pan and bring to the boil. Then remove from the heat and let it cool slightly. Add the lemon juice and the Greek yogurt and whisk. Pour into two serving glasses and chill for a couple of hours until set. These tasted lovely and I would like to make them again, though I might see if I can substitute something like Quark for the double cream as that would cut down on the calorie content a lot! So there you have it - my recreation of the meal Katniss shares with Cinna in the Hunger Games. I am sending this to Cook The Books for this month's Hunger Games challenge. I am also sending this to Food 'n' Flix, a similar challenge that picks a movie as its theme each month. For January, Food 'n' Flix has teamed up with Cook The Books and also has the Hunger Games as its theme. Lovely dish! I have that passage marked in the book, as well. I'm happy that you joined us for Cook th Books & Food 'n Flix this month...hope you'll join us again! Good take on the challenge. I would enjoy that meal as well, especially the creamy pannacotta pudding. you are so adventuous with your cooking. Cool post caroline,katniss would be proud! I was the same with the hunger games....watched the film first went straight online and order the first two books. I just sent you my very first recipe for the alphabakes hope u get it. Love your dinner...especially the honey-colored pudding. I will put that on my to-cook list. You truly outdid yourself. I never even considered trying to duplicate and entire Capitol meal. I am definitely making the panna cotta!!! Glad you joined us! What a veritable feast! I like the creamy orange chicken but I LOVE that pudding!! Wow - what a delicious sounding feast! It makes me want to try an interpretation of that scene, too! The chicken in orange sauce was one that I was considering making, too. You did a beautiful job and I love your rolls. Thanks - shaping the rolls was probably the hardest part, I'm not sure they look much like flowers! I am a bad co-host who had a crazy month and is just finally getting around to look at all the entries. ;-( Thanks for joining in this round--hope to have you back again!